„Rot und weiß“ heißt es in dieser Woche bei Merry Monday… und erstaunlicherweise war meine erste Assoziation „Essen“ und die zweite „Pommes“. Beide nicht wirklich Weihnachtsthemen. Aber dann wurde doch noch was draus. 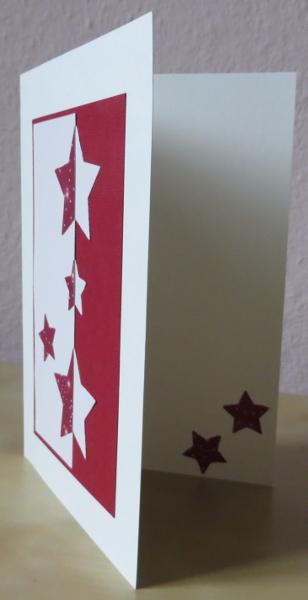 „Red and White“ is this week’s challenge over at Merry Monday… I was surprised that my first association was (the city of) „Essen“, as their soccer club is „Red-White Essen“, playing fourth league. And the second association was „French Fries“ as they are (most?) often had with ketchup and mayonnaise here – so you order „French Fries red and white“. None of them with any clear connections to Christmas. But I did pull it together in the end. Zu guter Letzt kann ich noch erfreut verkünden, dass meine Santa Shaker Karte bei den Jingle Belles eine von dreien war, die besonders hervorgehoben wurden… und da habe ich doch gleich mal einen neuen Reiter oben eingeführt, Wins & Achievements – der sich hoffentlich bald weiter füllt. Genießt euer Wochenende! Before I let you go, I’m happy to announce that my Santa Shaker Card was chosen among the top three so-to-speak at the Jingle Belles. So I’ve decided to add a new tab above, Wins & Achievements – which will hopefully be added to soon. Enjoy your weekend! Love the positive/negative design – very pretty! What a great idea to use positive and negative space on your layers! Thanks for playing with us this week at Merry Monday! Congrats on your Top Three!! And this is another terrific card! I love the star … So very effective! 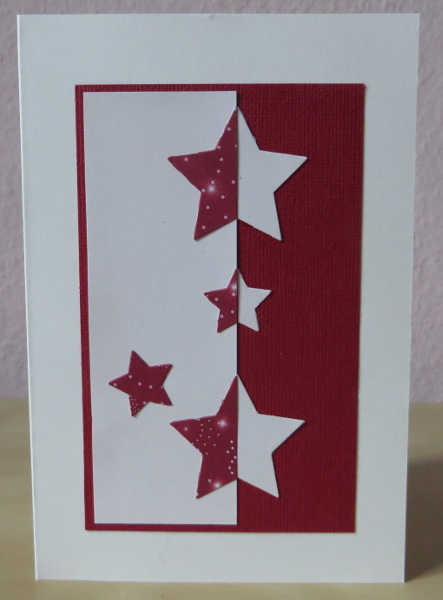 Love this „star-filled“ card! Very cool design! Thanks for joining us at Merry Monday this week for my red/white challenge! I like how you used the DSP for the dark half of your stars, great technique. Thanks for joining us at Merry Monday. Congratulations again, although it seems I’m playing catch up & reading your blog backwards!